Whether you are hosting an open house, cocktail party, or just don't have the ability to seat guests at a table, there are occasions where you need to offer food to a crowd of people who will have to eat on their feet. While it is almost always preferable to have seating available for guests, along with table surfaces for them to use to hold plates and drinks, it isn't always possible to arrange this for each guest. I have spent many a party clutching a glass and balancing a plate on my knee perched on a chair, or have juggled both in my hands while wandering around a large room. I have combined my experiences with this type of party as a hostess with my frustrations as a guest to help you create a party that is very user friendly. This makes your guests more comfortable, doesn't cause wasted food, decreases the numbers of spills and stains that are legendary with this type or party, and is also hopefully easier on the host. Don't serve food that needs to be cut. There is nothing more frustrating than trying to cut a slice of ham into bite sized pieces while holding a plate. Things like large chunks of steamed broccoli, huge pieces of lettuce, baked potatoes, or other large items are not suited for stand up dinners. Don't serve food that is easier eaten with more than one hand. Noshing on chicken wings one handed is an art form, and many people have not developed it. When you add a drink and plate into the equation, food needs to be very portable and easy to handle. Don't serve round items. Seems silly, but how often have you seen grapes, unsauced meatballs, or olives take a header from a plate? The one exception to this is if they are toothpicked to prevent rolling. Don't serve anything with a sauce. OK, so you can get away with a few sauced or dressed items, but keep in mind that when individuals are holding their plates they are not always balanced. The sauce that is really great on one dish is not so great on another dish…and is even less enthralling on your carpet. Don't use flimsy paper plates. Paper or plastic plates are fine…but make sure they are very sturdy. People tend to load up plates with more food than seems possible and flimsy plates are not up to the task of being carried with a full load of food. Don't leave space on the buffet table for people to put their plate down. Before you accuse me of cruel and unusual punishment, there is a real reason behind this. I have seen it time and time again…if people have to hold their plate while getting food, they are more careful about balancing their plate and not over loading it. It is much easier to stack things or really pile on the food if the plate is on a stable surface. Don't leave anything valuable or really sensitive to staining or marking unprotected or even in the room your guests will be using. I have heard terrible stories about furniture that has been in the family for generations destroyed by accidents or careless guests placing drinks on furniture without a coaster. Remove any special furniture from the room or else protect it. Soft furniture can be protected with slipcovers and tables and other pieces of furniture should be covered first with a waterproof material and then a decorative cloth. Don't serve dishes that require a bunch of accompaniments. While offering a salad with a variety of dressings and toppings to use is nice for the guest, maneuvering plates to add dressing is always tricky and the whole process can really tie up your buffet line. Do provide small plates. They are much easier for guests to handle and they can always come back for seconds. Do make sure your casseroles and salads are composed of small, easy to eat ingredients. Make sure everything is bite sized for even the most delicate of eaters. Remember that what is bite sized for you might not be for someone else and you want to avoid making guests cut or chop ingredients. I see this most often with tossed salad, which many hosts do not think about as being difficult to eat. Do provide tons and tons of napkins. Do offer a wide range of food that can be picked up and eaten without a plate. 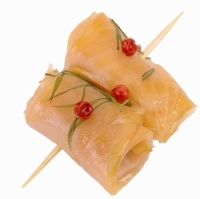 Skewered or toothpicked vegetables, fruit, cubed meat, and cheese cubes are all great examples of this. This allows guests who want to snack without a plate to do so easily. Do keep the area around the food table clear. Don't encourage guests to linger near the table by placing other tables or chairs near the area. Do make sure you have enough seating for everyone who might have to sit. This would include the elderly, anyone who has any physical handicaps, or who just cannot stand for long periods of time. Do remove any unnecessary furniture and knickknacks from the area. You do not want your guests stumbling over footstools or moving your precious collectibles to find room on the table for their plate. Do offer specialized areas and break up the buffet into smaller stations. You can break up your buffet by food style, such as hot food in one area and desserts in another, or else you can create smaller stations for specific dishes. Two popular stations are a make your own salad, which is like a mini-salad bar and a dessert bar. For a salad station, offer a big bowl of salad greens along with bowls and bottles of dressings, vegetables, croutons, and other toppings. A dessert station can simply be composed of make your own sundae materials, or can offer a variety of dishes to be eaten together or separately. An example of this would be a table with pound cake, angel food cake, fresh fruit, fruit sauce, chocolate sauce, whipped cream, and a variety of homemade or commercial ice creams.